When you’re achingly close to meeting your little one, every little twinge makes your heart leap. Your tummy suddenly feels super tight – surely that’s a contraction? Or is it Braxton Hicks? It can be tricky to know if you’re having Braxton Hicks or real contractions, but there are some key ways to spot the difference. It’s all about how intense and how often you’re feeling the surges. They’re often called practice contractions because Braxton Hicks are exactly that – your uterine muscles practising for the real thing. While they can feel intense, Braxton Hicks don’t actually dilate the cervix. That’s what real contractions do. If it’s your first baby, it can be confusing – Braxton Hicks can feel like the real thing. Especially if you’re nearly at the finish line and desperate to meet your little peanut! If you’re really not sure, contact your obstetrician or midwife to check you’re not in preterm labour (earlier than 37 weeks pregnant). 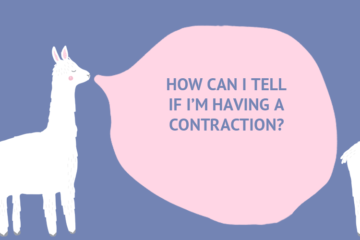 Contractions are the muscles in your uterus tightening and relaxing. This is helping to push your baby down and open your cervix so your baby can be born. Contractions are painful, feel strong and last longer than 30 seconds. They will get stronger, more painful and you’ll get shorter breaks between them. The key is to look at frequency and intensity. Birth educator Stacey Astley-Clark explains that Braxton Hicks are your ‘body’s way of warming up for the main event’. “They aren’t usually painful and feel more like a ‘tightening’ sensation or a mild cramp. If you touch your belly during a Braxton Hicks, it can feel quite hard. 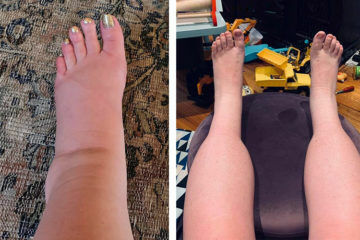 The biggest difference is that Braxton Hicks will eventually disappear. They should only last for a short time and won’t ramp up in intensity. Where do you feel Braxton Hicks? 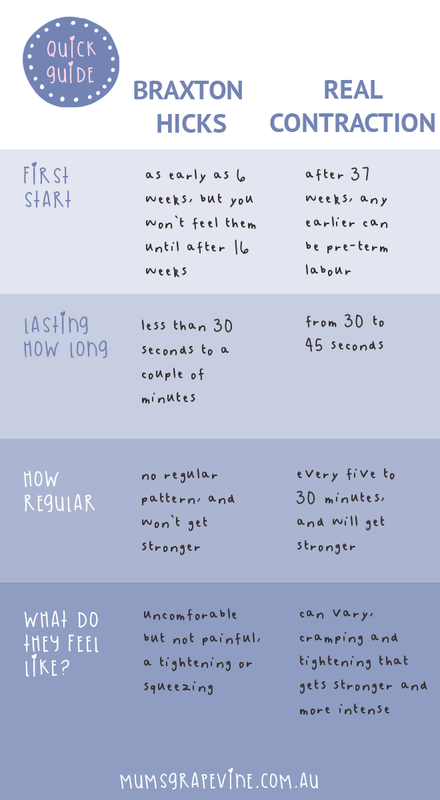 Braxton Hicks feel different to contractions, but it can be hard to tell the difference when it’s your first baby. Specialist obstetrician Dr Gary Sykes says they are usually felt in one area of the uterus. What if I can’t tell if it’s Braxton Hicks or labour? Dr Sykes says, “Just because you are coping with contractions at home you must not assume they are false labour pains. If the whole of the uterus is contracting or the contractions are becoming stronger or more frequent (especially if they are every two to three minutes) you must give the Birth Unit a call and make your way to the hospital. How can I ease Braxton Hicks symptoms? If you’re walking around, try lying down, often they will subside and vice versa. Make sure you drink plenty of water because the uterus is a big ball of muscle, and when you are dehydrated the muscles can spasm. Remember to have a wee! Yes, it’s that simple. Often a full bladder can lead to Braxton Hicks contractions. So jump up and have a pee. You can also try taking a warm bath or having a massage – if nothing else you’ll feel relaxed! 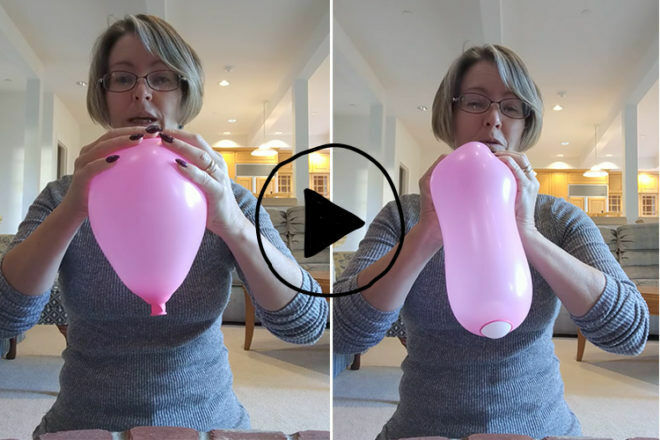 Take a look at this clever video if want to see a great visual demonstration of how Braxton Hicks are different to real contractions. Q&A: How can I tell if I’m having a contraction?